I have to admit, I am ready for September to be gone! I am ready for cooler weather. I am ready to wear boots. I am ready to eat warm, hearty soups. And chili. And winter squash. I love Fall and everything that goes with it! I am ready for bright orange and red and yellow leaves on my neighbor’s Bradford pear trees. I am ready to carve pumpkins and take Halloween pictures of my dear little girls. I am ready to turn 33. I am ready. Bring on October! 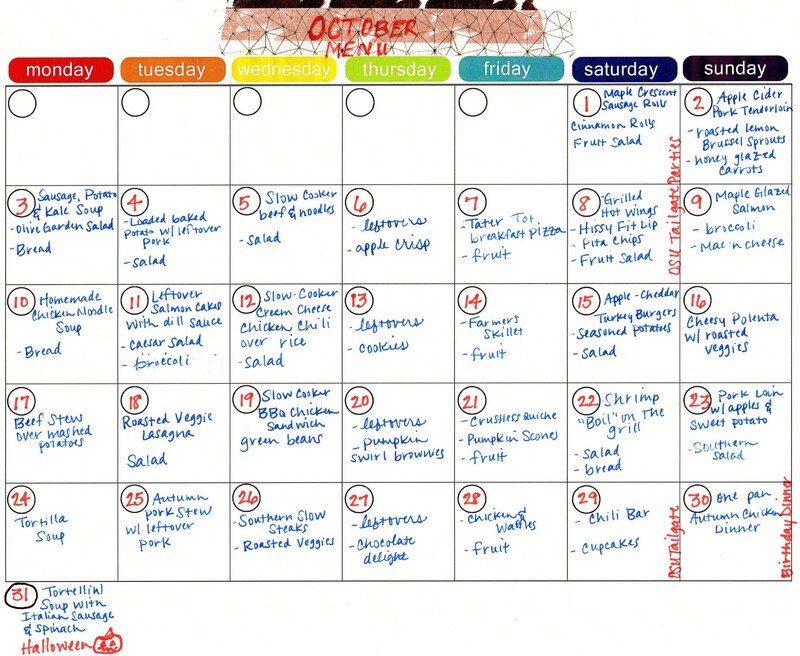 And bring on my scrumptious October menu! I am so excited to eat all of these delicious dinners…. You can find recipes on my October 2016 Menu Pinterest Board, but a lot of it you’ll already have an idea of how you want to make it, that is if you actually use any of my ideas. I don’t really know if you do. I just imagine that my 12 faithful readers are excitedly printing off these monthy menus and following them to a T! Ha! Well, here it is, ladies and gentlemen. Enjoy! I don’t know about you, but when my kids get home in the afternoon (one after a day of kindergarten, the other after a day at daycare) they are hungry and cranky. I know that the kindergartner has had 2 snacks since lunch and the toddler had a snack about 15 minutes before she got picked up, they are staaaaaarving. And asking the question “How was school?” has reduced my 5 year old to tears on more than one occasion. Set out food for the kids to find when they get home. Don’t ask them if they are hungry, just assume they are. Set out something healthy that won’t ruin their appetite for dinner like grapes, carrot sticks, or a few crackers with cheese. One of my professors told me that when her son was small, the daycare he went to offered a small cup of chicken noodle soup for an extra $1 or so at 4:00 pm to help kids with this afternoon problem. Just sit quietly in the car. Greet your children at pick up with a smile and a hug and that’s it. Don’t ask them questions right away. Let them decompress and think alone. They’ll open up later- maybe during family dinner. Allow them time to themselves in their rooms. Pretty simple. I tried this yesterday, but it was not perfect because like every other “normal” American family, we had somewhere to be at 6:30. I offered food right away and gave big hugs, but we had to quickly get changed for the 4-H Banquet. It’s hard on kids to rush around like that, but sometimes it can’t be helped. I will add my own last advice: Forgive yourself for not being perfect. Try these things. See how they work. And let yourself off the hook if you have to rush everyone off to an event of some kind. I love Fall! I love everything about it. Cool weather. Jackets and sweaters. Boots. Coffee. Cinnamon. Pumpkin Pie- like real pie, not pumpkin pie flavored other stuff. Football. Leaves… You get the drift. I love the smells of fall too, but it’s still pretty warm here in Oklahoma and it still smells like hot old summer. To make the house smell like it’s crisp and cool outside, fill a pot halfway with water and put it on the stove. Throw in some cinnamon sticks, orange peel, cloves and bay leaves. Put it on low heat and let it simmer away! It’s fall- even if only on the calendar and in my heart! I have mentioned this salad several times on my blog, but I don’t think I’ve ever done an actual recipe post for it. I had it as a side salad at a well-known restaurant that recently went out of business in OKC. It didn’t go out because it wasn’t a popular place to eat, but because it’s owner and namesake left the state- for *ahem* California. I start with a handful of greens in a bowl. I like romaine, but you could use a mix if you like. Next, I throw in very thinly sliced red onion and very thinly sliced red bell pepper. I cut cherry tomatoes in half lengthwise and toss them into the bowl. I also add in some goat cheese crumbles- just a little. Lastly, top it all off with cornbread croutons. I like to toss mine in blue cheese dressing, but you could use whatever dressing you like. Please don’t leave out the onion. The onion makes it. You’ll thank me! **The picture above was taken from Yelp.com. 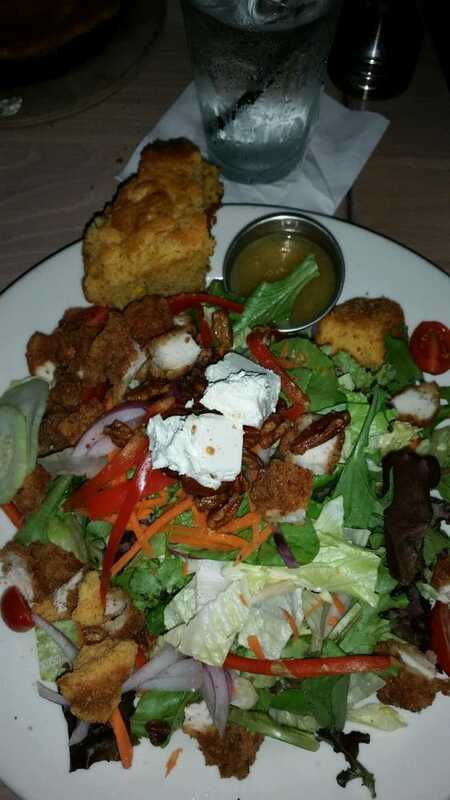 It’s this salad with fried chicken on top. I was reminded of this little tip last week. I know I have mentioned before that I am in grad school. This semester, I am in class from 12:30 to 7:10 on Wednesdays. It’s a LONG day. I eat lunch before I go, but I need a snack sometime in there. I forgot my snack last week, and luckily, one of my classmates took pity on me and shared her popcorn. If you know your schedule is busy. If you know it’s going to be a while before you get home to eat dinner. If you do not want to run through the drive-thru…. again. Pack a snack. Or two snacks. What are your favorite snacks to take on the go? A big problem is not having refrigeration. I’m always looking for new ideas! I love having a new goal for fitness. I blogged back in the spring about training for my first 10K, but since then I have had a hard time getting motivated to work out. There is a particular brand of fitness videos on the market that I enjoy, and the company even offers “virtual coaching” when you sign up for a free account. That was great for a while. My coach put together Facebook groups for specified time frames or maybe for a specific new program that had come out. It is motivating. But I’m currently in a rut. I might get some motivation from buying a new program, but they are kind of expensive and given our current financial goals, I just don’t want to spend the money. I downloaded the Nike fuel app, hoping that might help. It’s too early to tell. So please tell me- how do you stay motivated when there isn’t a big goal to work for? I have no real advice to give here. I am asking for your ideas. Top your cereal with bananas or raisins. Or, mix fruit with plain, fat-free or low-fat yogurt. Place fruit in a large bowl and mix with pineapple juice. Let stand for 15 minutes at room temperature. Place 1 cup of fruit salad in a small bowl and top with ½ cup of yogurt. Sprinkle almonds on top of each fruit salad. Serve immediately.